Guest accounts can be created for external, third parties who are not members of a specific organization. 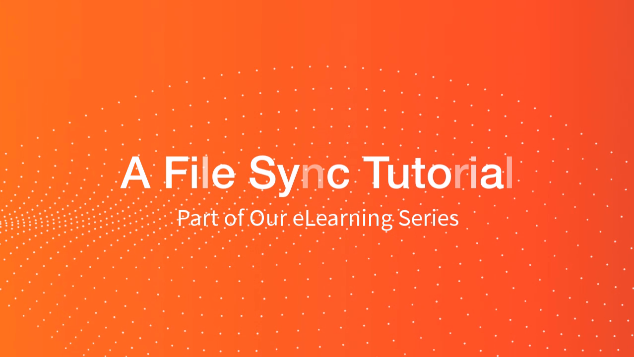 These users have limited access for a fixed period of time, allowing for the transfer of files or folders, or for group collaboration on specific content. Administrators can create a new guest in the Guests tab of the administrative web portal. End users can create a new guest in the Guests tab of the end user web portal. The system automatically creates a new guest when private share links are sent to unregistered email addresses. For more information, please reference the Receiving and Sharing Content with Guest Users Knowledge Base article. Using the Guests tab in the administrative web portal, administrators can see and manage all active guest accounts. As a best practice, we recommend reviewing the Guests tab on a regular basis, and deleting guest accounts that no longer need access to files and folders. When a guest account is deleted, he or she no longer has access to secure share links. In the Organization navigation menu, select the organization in which you want to manually create guests. The selected organization displays. Click the Guests tab. The Guest Accounts page displays, listing all of your existing guests. In the Guest Accounts page, click the Create Guest Account button. The Guest Settings page displays. In the First Name field, enter the user’s first name. In the Last Name field, enter the guest user’s last name. In the Email field, enter the guest user’s email address. In the Password field, enter password credentials; alternatively, click the Auto-Generate checkbox to allow the system to automatically generate a password for the guest user. The user will be prompted to change an automatically generated password when he or she first logs in to the web portal. In the Confirm Password field, retype to confirm the password if it was manually typed into the Password field. Use the Password Expires field if you would like to generate a time-sensitive password for the new guest user. You can select from 6 hours, 12 hours, or 24 hours. If you do not want to generate a time-sensitive password, leave this drop-down field set to Never. By default, the Send Welcome Email checkbox is selected, which will send a welcome email to the new guest, containing information about how to access the system. Uncheck this checkbox if you do not wish to send a welcome email. Note: If you deselect this setting, remember to manually contact the guest yourself to share login information. Alternatively, utilize the Send Message feature as described below. Optionally, to send a message to a guest user, select the checkbox next to the appropriate account, and click the Send Message button. An Email Guests dialog box displays, allowing you to compose an email message directly from your web browser. 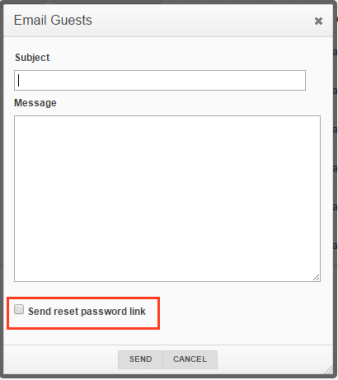 You can also click the Send reset password link checkbox to provide the selected guest account with a link to reset his or her password. To delete a guest account from the system, and revoke access to all items that were securely shared with that guest, click the Delete button. Administrators can also convert a guest account to a standard user account. In the Guests page, click the Edit button. The Guest Account Settings page displays, allowing you to edit the guest account. In the Guest Account Settings page, click the Convert to Standard Account button. You will be asked to confirm this change.